The 2016 Hispanic Heritage Month calendar of events has been set and includes many diverse cultural and educational programs at Youngstown State University and throughout the community. The YSU Hispanic Heritage Planning Committee through the YSU Office of Student Diversity Programs has partnered with the community for the celebration. “A Growing Connected Latino Culture” is the theme for this year’s celebration. Hispanic Heritage Month runs Sept. 15 to Oct. 15. For more information, call 330-941-2087. Thursday, Sept. 15 to Friday, Oct. 14, “A Growing Connected Latino Culture,” Notable Latinos, YSU Maag Library. A display of items from the Maag Library collection featuring the important contributions of renowned Latino authors, poets, musicians, painters, etc. The exhibit is on the main floor of Maag Library on the YSU campus. For information contact Ana Torres at 330-941-1717 or amtorres02@ysu.edu. Thursday, Sept. 15, 12:15 to 1:15 p.m. Opening Ceremony, Mahoning County Courthouse, Rotunda (120 Market Street, Youngstown). The event will feature a flag ceremony representing 22 Hispanic countries as well as a musical performance by Cristian and David Labra. The keynote speaker will be Fran Wilson. YSU graduate student Catherine Cooper will emcee. Light refreshments served. The event is co-sponsored the YSU Hispanic Heritage Planning Committee and the Office of Student Diversity Programs. For further information, call 330-941-2087. Friday, Sept. 16, 3 p.m. What Can The History of Mathematical Abstraction Teach Us About the Automation of Economic Processes, YSU Lincoln Building, Cafaro Suite, Room 510/ Modern computing technology allows for the automation of economic processes, which were not possible before. Mario Morfin will explore some aspects of the new economic relation between humans and economic automata by looking at the historical divide between abstract mathematical models and real life processes. Morfin is cofounder of MOAI Solutions and Research Assistant at York University, School of Informational Technology. Sponsored by the YSU Mathematics Department, the Office Student Diversity Programs, and the Mathematical Association of America through a Tensor-SUMMA Program grant. For more information, contact Alicia Prieto Langarica at aprietolangarica@ysu.edu. Sunday, Sept. 18, 4 p.m. Fiesta Latina Dinner, St. Brendan’s Church, Maxwell Hall, 2800 Oakwood Ave., Youngstown. Sponsored by the Our Lady of Guadalupe festivities committee, the dinner features “Carnitas” (braised pork), traditional cuisine from the Mexican state of Michoacán. The event is in honor of the Hispanic countries celebrating their Independence Day in Sept.: Costa Rica, El Salvador, Guatemala, Honduras, Nicaragua, Mexico and Chile. Cost is $10 per person. Tickets available at the door or in advance by calling 330-719-7839, 330-770-0422, or 330-770- 5646. Tuesday, Sept. 20, 2 p.m. Studying Abroad in Latin America: Benefits Vs. Myths, YSU Kilcawley Center, Presidential Suites. With a growing Latino population in the U.S. and increasing connections with Hispanic countries, there is a higher demand for professionals who are able to understand and relate to Latinos. A panel of YSU students and professionals will share their immersion experiences in Latin American countries. Their stories will illustrate the benefits of studying abroad while debunking myths and preconceptions. Co-sponsored by the YSU Hispanic Heritage Planning Committee, the Center for International Studies and Programs (CISP), and the Office of Student Diversity Programs. Light refreshments served. Contact Ann Gardner at amgardner01@ysu.edu. Friday, Sept. 23, 3 p.m. From Swap Meets to Fractional Derivatives: How I Decided On a Career in Academia, YSU Lincoln Building, Cafaro Suite, Room 510. Finding the inspiration to pursue a career in mathematics is a unique experience. Cynthia Flores, a Mathematics assistant professor at California State University, Channel Islands, will discuss her journey towards a PhD in mathematics and explore the role of fractional order derivatives as they occur in certain partial differential equations. The presentation is co-sponsored by the YSU Department of Mathematics and Statistics, the Office Student Diversity Programs and the Mathematical Association of America through a Tensor-SUMMA Program grant. For more information, contact Alicia Prieto Langarica at aprietolangarica@ysu.edu. Thursday, Sept. 29, 9 to 11 a.m. ECHHO College Fair, OCCHA, 3660 Shirley Road, Youngstown. The 2016 Annual Educators and Community Helping Hispanics Onward, Inc. (ECHHO) College Fair is for underrepresented high school students and their parents to learn about the college preparation process and the Hispanic/Latino scholarships available to those who qualify. Co-sponsored by YSU’s Office of Admissions, OCCHA, and ECHHO. For information, contact Maggie McClendon at 330-941-3243 or visit www.echho.org. Friday, Sept. 30, 3 to 5 p.m. International Students Coffee Hour, YWCA, 25 W. Rayen Avenue, Youngstown. Join us as we mingle with YSU students and the community, and enjoy the delicacies of Latino desserts, coffee, and music. Co-sponsored by the YSU Hispanic Heritage Planning Committee and the Office of Student Diversity Programs. For more information call 330-941-2087. Sunday, Oct. 2, 3 p.m. 6th Annual Non-Violence Parade & Rally. Join the YSU Hispanic Heritage Planning Committee and the YSU Latino Student Organization as they participate in the annual Non-Violence parade. The parade line-up begins at 2 p.m. at YSU’s Williamson College of Business Administration (West Wood and Hazel Streets) and ends in downtown. For details, contact Penny Wells at 330-788-0545 or pennywwells@sbcglobal.net. 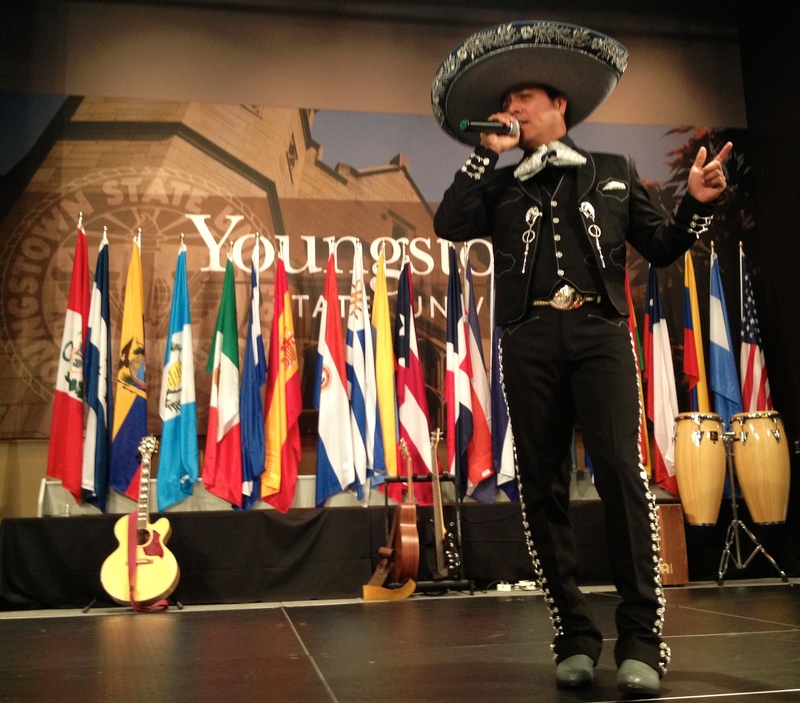 Saturday, Oct. 8, Noon to 3 p.m. Hispanic Heritage Celebration, YSU Kilcawley Center, Chestnut Room. This main event, free and open to the public, will feature music entertainment, dance performances, children’s activities, cultural displays, student awards, vendors, information tables and ethnic refreshments. Dancing will follow to the beat of DJ Kenny Reyes. Parking is free for the first 50 guests in the M-1 Wick Avenue parking deck. Advise parking attendant that you are attending the Hispanic Heritage Celebration to receive a parking pass. Event coordinated by the YSU Hispanic Heritage Planning Committee through the Office Student Diversity Programs with support from campus and community organizations. For information, please call 330-941-2087. Friday, Nov. 4, 5:30 p.m. OCCHA’s 44th Annual Fundraiser Gala, Antone’s Banquet Centre, 8578 Market St., Boardman. The Organización Cívica y Cultural Hispana Americana, Inc. (OCCHA), a social service agency serving the Hispanic and Multi-Cultural community, is celebrating 44 years of service with an adults-only fundraiser at Antone’s Banquet Centre. Cocktail hour begins at 5:30 p.m. and dinner is at 6:30 p.m. with musical entertainment. There will be auctions and drawings. Tickets are $50 per person. For tickets and information call 330-822-GALA or email occhagala@gmail.com.